While enjoying this vacation, I managed to steal few hours to do some fun coding. Nothing spectacular, but it yielded something I will surely share in the near future. However, since I am still in the mood of bombing the planet again, here is another post with food pictures. Something else we were glad to taste during our extremely short visit to Bandung were Putu and Kelepon, typically sold at the price of 1 EUR for 25 pieces. 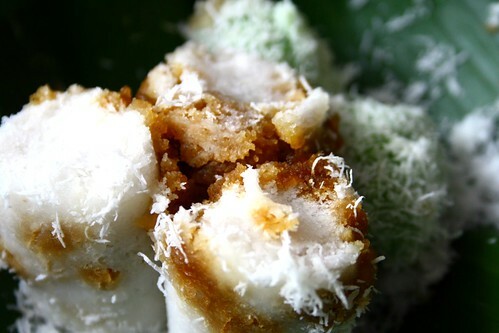 They are basically rice cake filled with palm sugar and served with grated coconut. Putu is steamed, while kelepon is boiled. The latter is also colored using pandan leaves. While sampling culinary specialties means that we do not cook quite often, when the opportunity presents itself, it is of course a good feeling to eat something home-made once a while. Here is one: Terang Bulan (literally: bright moon). 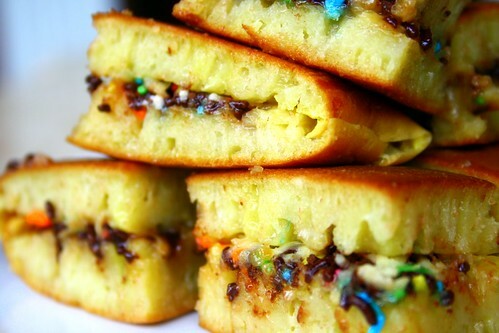 It is some sort of pancake, very similar to Martabak except Terang Bulan is filled with sugar, sprinkles, condensed milk, cheese, and the likes. Hence, it is also known as Martabak Manis (literally: sweet Martabak), a term that is somehow I dislike (because language-wise it is unnecessary as there exists a good name for that and thus it extends and pollutes the meaning of Martabak with a very weak reason). The recipe? Check what this lady has posted. Terang Bulan is sweet and healthy (reduce the amount of sugar if in doubt), it makes for a good snack in the afternoon. Last but not least: Eid Mubarak to everyone! i need your help because i didn't find anyone how could response to me. how can i change the opacity of a QImage in Qt? please note that the pixels in the image are freshened with setPixel with alpha = 255 periodically from left to right and i want to fade the image eventually. indeed as a result the image start fading from left to right and this procedure repeated periodically. in windows i found a method to do that by composition mode of qpainter.if you want i can describe that for you. but it doesn't work in linux properly. awesome food pic as always.